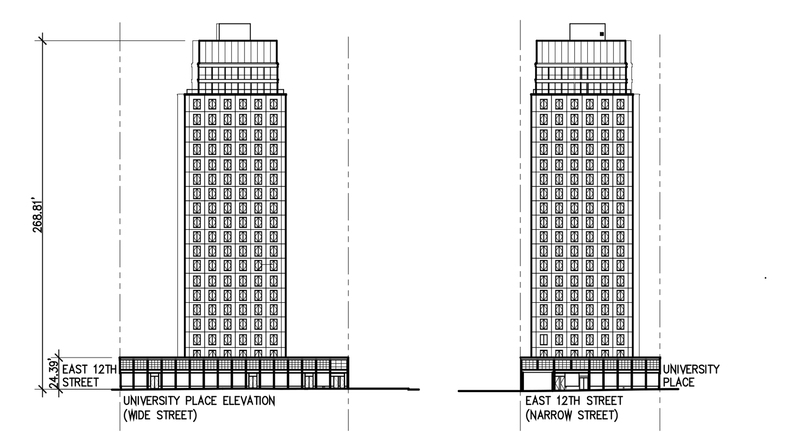 Here’s our first peek at the 23-story condominium tower replacing the former home of Greenwich Village‘s iconic Bowlmor Lanes at 110 University Place. 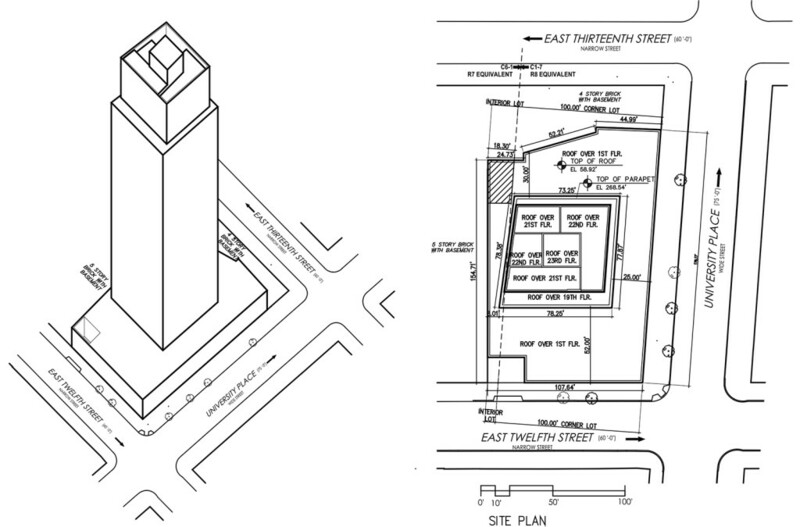 Documents filed with the Department of Buildings depict a modest 280-foot-high tower rising from a block-long, one-story retail podium. 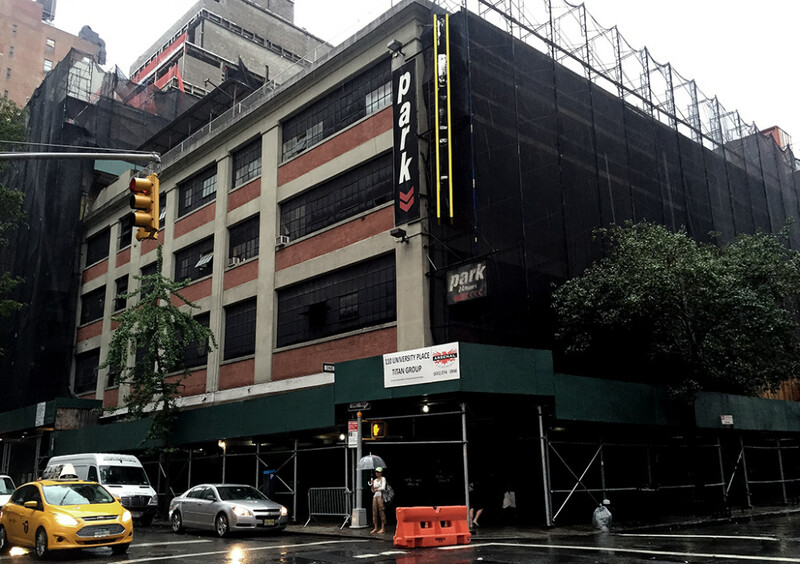 Situated on a charming stretch of University Place lined with an assorted mix of low and mid-rises, the existing four-story, 75,000-square-foot building housed a parking garage in addition to the famed bowling alley. 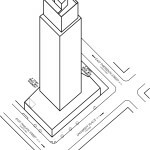 In 2012, Billy Macklowe, founder and CEO of William Macklowe Company and son of 432 Park Avenue developer Harry Macklowe, purchased a long-term controlling position in the building, which effectively made Macklowe the building’s landlord for the next 72 years. Preservationists previously feared a scheme of more than 300-feet tall, which would have become one of the tallest buildings in the neighborhood. 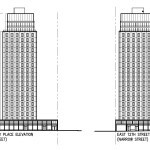 The 280-foot height depicted in submitted DOB drawings is now in line with many of its nearby neighbors, including One Fifth Avenue and The Brevoort East. 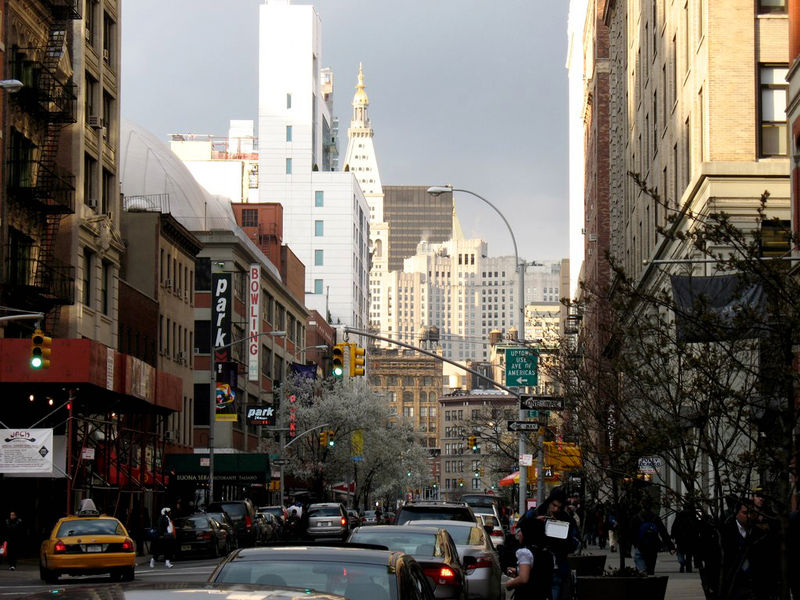 There have been efforts to landmark or rezone the stretch of University Place to prevent developers from assembling large parcels to erect out of context towers. More worrying, however, will be the low-slung glass base and its future tenants, which may be out of character with the vibrant street. While the design architect has not been reported, SLCE Architects is recorded as the architects of record in the filings. 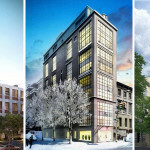 From what we can tell, the tripartite massing is composed of a glazed commercial base, 18-floors of evenly spaced punch-hole windows, and a two-story crown wrapped in ribbon windows. 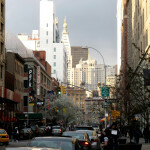 While the massing is crude and somewhat insensitive to its Greenwich Village context, it recalls the wedding-cake style towers promoted by the city’s 1916 zoning resolution. 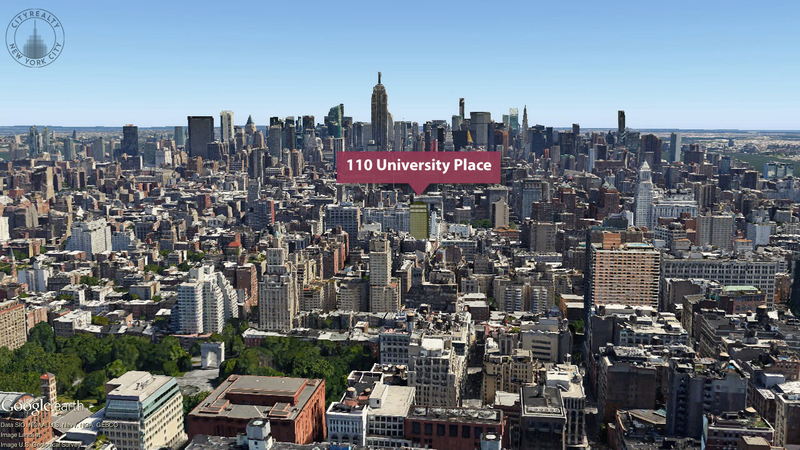 110 University will contain 56* residences averaging more that 2,000 square feet each. 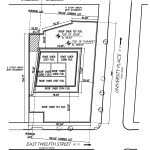 Amenities will be typical of other high-end condo affairs, including basement storage, on-site parking, a laundry room, and fitness center. The roof of the one-story base will be a residents’ amenity terrace. 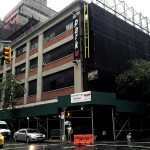 Two parking garage-to-condo conversions are well underway near 110 University–17 East 12th street and 12 East 13th street, where, according to CityRealty, there are eight homes available priced at an average of $2,989 per square foot, ranging from a three-bedroom unit for $6.5 million to a five-bedroom penthouse for $30.5 million. 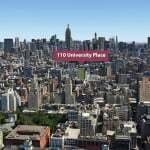 *Update: 6sqft first reported this figure as 52 units. A schedule dated June 30, 2015 reflects a total of 56 units.